How to Erase SMS & Contacts from Samsung Galaxy/Note Permanently? Capturing the global market, Samsung, South Korea's largest multinational group, has been selling its electronic mobile devices to a whole myriad of consumers worldwide. Samsung's smart phones, especially the Samsung Galaxy S series and the Note series, are extraordinarily favored by many, particularly white-collar workers and college students. The lately launched product Galaxy S4 provides functions supporting turning pages and controlling video playing with eyes rolling, and Note 3 has a 5.7-inch full HD screen with a high-resolution camera and an Exynos 5 Octa dual quad-core processor. My friend has recently purchased a Samsung Note 3. She can't take her eyes off it, and keeps downloading funny games, reading news, taking photos and watch movies on it. As users of Samsung Galaxy or Note phones, do you have similar experience? Is it necessary to wipe text messages and contacts from our phones? You may take tremendous interest in your phone's new functions, but you should also take note of what it calls for when you need to manage your contacts and text messages. Are there any times when you want to permanently delete them? When you want to free more space for new files, when it's necessary to remove spam messages or contacts you will no longer use, when a friend asks you to lend your phone to him or her, and when you want to sell it to strangers in case that they will read your private conversations. It will surely be bothersome and embarrassing to have your information stored inside shown to others. Then it's of paramount importance to remove them permanently from your phone. Your text messages and contacts will not disappear forever when you simply press "Delete". When you add a sufficient amount of new data to fill up the space, the memory in which your old data are stored will be reoccupied and won't stay inside your phone any more. If you store them in your SIM card, then after you deleted them, there may also be space to store the leftovers of part of the deleted data. If the data are downloaded, a few hundred of them can be remaining in your phone even when you have erased them. Considering the circumstances, you need to seek an effective way to wipe the data permanently without being restored or being able to be read by others. Coolmuster Android Data Eraser (for Windows 10/8/7/XP/Vista) or Coolmuster Android Data Eraser for Mac (OS X 10.10 or later) is such an efficacious tool. The remains of your contacts and text messages can be deleted forever from your Samsung Galaxy or Note phone in an instant. Not a single other software can recover them in any way, either partially or completely. It will clear all the space occupied by the deleted data and spare a larger memory for you. As it being so safe, quick and helpful, why not have a try? You'll regret it if you miss it! Practise says everything! You can free download the functional software via the download button as below and follow the step-by-step guide to erase your private text messages and contacts info from your Samsung Galaxy S9/S8/S7/S6 or Samsung Galaxy Note 9/8/7 on Windows PC. The operations are the same on Mac OS X. Note: Since the deletion performed by this software is permanent, we kindly suggest you backup your important information at first before you start the erasing on your phone. 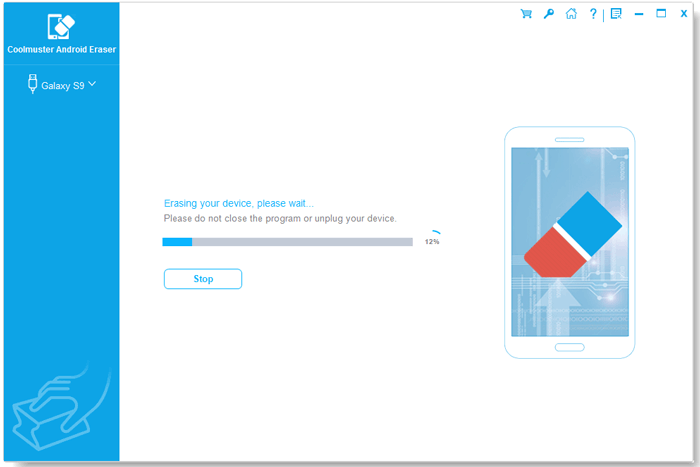 First of all, connect your Samsung Galaxy S or Samsung Galaxy Note to the computer with a USB cable and launch the installed Coolmuster data eraser software. Once the connection is successful, the software will automatically detect your device and show it, along with its parameter information on the program interface. Tips: Not only Samsung Galaxy/Note, the software also supports other Android devices, including Xiaomi, Huawei, Motorola, HTC, LG, Google and so on. Here are three levels of data erasing provided by the program. 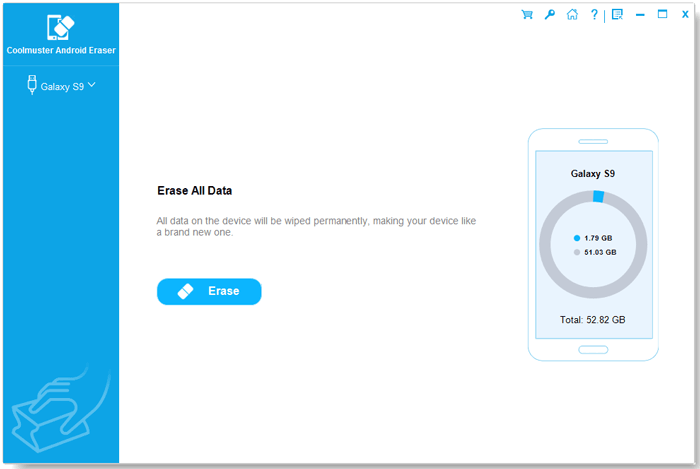 The first level will erase your phone data quickly to save your time. The second level will leave no traceability of data erasure and use random data to overwrite all existing and deleted data on your phone. 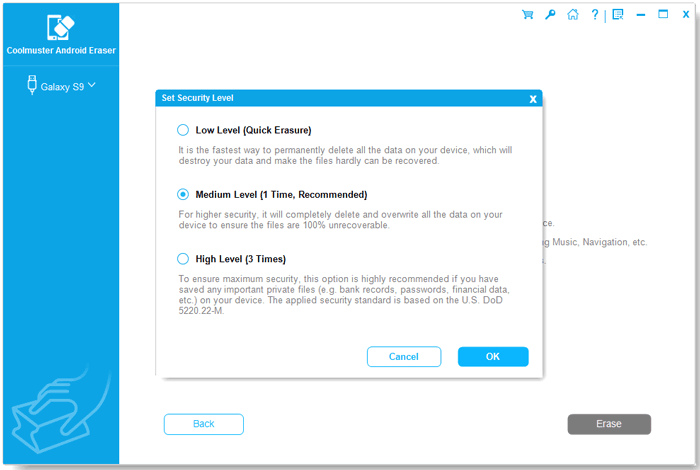 The third level is the most secure option which will write over the data 3 times. You can directly use the default second level. Choose the text messages and contacts you want to delete for good. After choosing your wanted erasing level, all the text messages and contacts, you can click the button of "Erase" to delete them all from your Samsung mobile phone at once. All erasing task only costs you a while. Step 4. 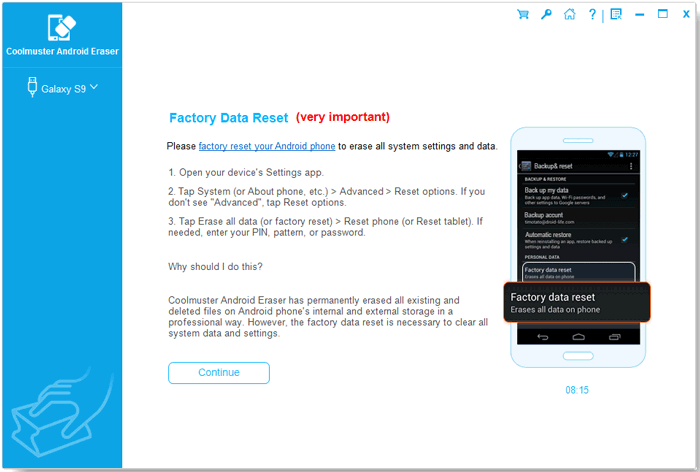 Factory reset your Samsung device. When the erasing and overwriting process is finished, please restore your device to factory settings to wipe out all system settings on your device. When the erasing is finished, no any data recovery software can detect or recover these deleted files from your phone. Sounds amazing? Why not give it a try?